Candidate Barack Obama wanted to “fundamentally transform” America. The current leadership of the societal, political, theological, and cultural left in America today want to erase it all together. They don’t just despise some historical lapses in what she has been. They despise what she has become and they wholesale want a different nation all together. This week we saw more than one example. Following her call mere weeks ago for leftist activists to “push back” against people she disagrees with, Maxine Waters found that encouraging her side to do so came with a lot of people asking for explanations from the other side. Why was she inciting violence against people who simply disagreed with her? This week she got wind that a group who disagrees with her might form a protest outside her office. She whipped her “supporters” into a frenzy and instructed them to wait outside her office building and to be ready confront the protestors if they showed. So what did the grand (likely paid off) supporters of Maxine Waters decide to do while being bored from not having some #MAGA voters to pummel? They chanted anti-American hate and burned the American flag. But these rabid America haters paled in comparison. In it a barrage of supposed employees of Immigration & Customs Enforcement reel off one liner after another that could each be a double meaning as though they were in fact members of a terrorist organization. It lacked the punch she hoped for in the humor department but without question planted the seed of her larger goal: to plant even through humor the subtle message that our law enforcement that serves at our ports of entry every day is as cruel, unlawful, and inhumane as those beheading innocent women and children, while burning their men in cages, in the Middle East. It is a hateful smear that can’t simply be laughed off. She believes this stuff. She is part of the proud Bernie Sanders-Cynthia Nixon-Alexandria Ocasio-Cortez socialist posse that is not only attempting to take over the Democratic Party but also hoping that 2018 & 2020 are the years that America as it is known, ceases to exist. They want literally zero border protection. They are so extreme that their heroes—their comrades—in San Francisco believe that our nation’s cities are somehow racist if they participate in the Joint Terrorism Taskforce. Of course it was formed as a partnership between federal, state, and local law enforcement to stop terror attacks before they happen. ICE is a key part of the preventing terrorism equation. Yet the stars for all things that “shine” at the moment for the American left are unanimous in desiring to see ICE dissolved. Their flag wavers in Congress are said to be preparing legislation to do so. Wolf’s idiotic “parody” takes it further though. Not only would she like to see the only border police force we have be disbanded, she wants them humiliated. 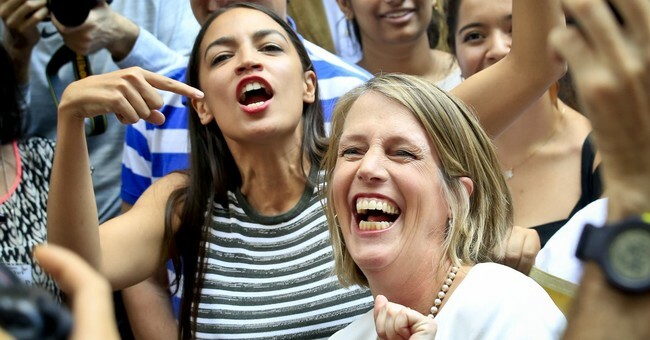 If she and Nixon-Sanders-Cortez and company had their way they would make them walk the streets in shame as the citizens of the new Socialist Democracy of (whatever they end up naming this country would be called) scream at them from the windows of the communal housing projects they’ve rounded everybody up and in to. As an aside it is this very group that also blew its lid when President Trump didn’t—in their opinion—sufficiently support our law enforcement and intel communities when asked a question at his Helsinki press conference with Russian President Vladimir Putin. And lest we forget these are the same leftists who seem to cover for the overt corruption in the processes of the DOJ and FBI instead of seeking to hold accountable and help reform. The truth is the left seeks one thing and one thing only—power. They care not about the threat of terrorism, the danger of MS13, or corruption in agencies and institutions which assist them. They claim that once acquired that power will be used to rule with justice and that the reckoning they will bring will even out injustices and wrongs long endured. Fortunately for the voters of 2018 and 2020 history has seen all of it before. Those who seek to use government—especially under the claims of good—to acquire more power, always end up using that power to corruptly destroy or further degrade freedom. There is little proof needed that America is roaring back to life since the last socialist was retired from the Presidency. A white hot economy, a stellar national defense, a new age for the entrepreneur, the individual, and the God given rights the authentic America affirms as theirs in her founding documents. The left has nothing but contempt for all of that. And they aren’t going to let us forget it!